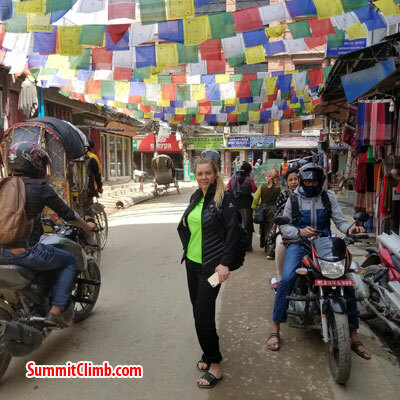 Blog posts: Our SummitClimb teams just summited Everest and Lhotse and all of our other groups achieved their goals. 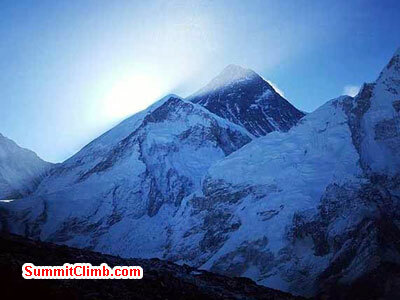 5 members and 4 Sherpas reached the summit of Everest. 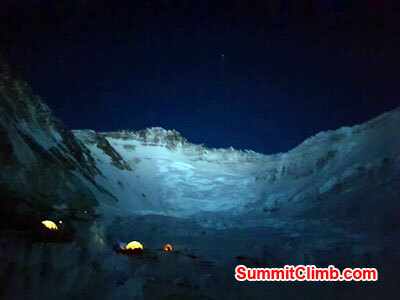 1 member and 2 Sherpas reached the South Col. 2 members and 2 Sherpas reached the summit of Lhotse. 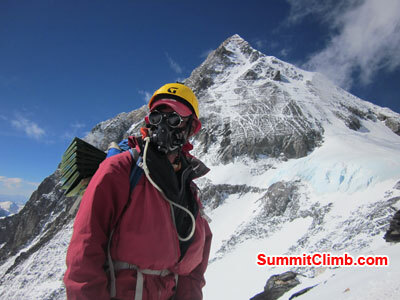 5 members succeeded in the Everest Training Climb and reached 7,000 metres / 23,000 feet. 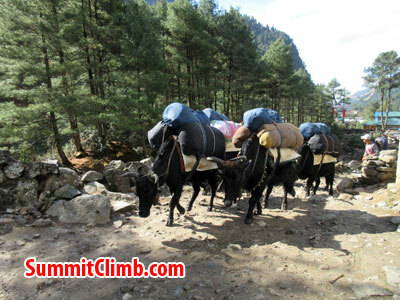 5 members trekked to basecamp and even slept there for a night. 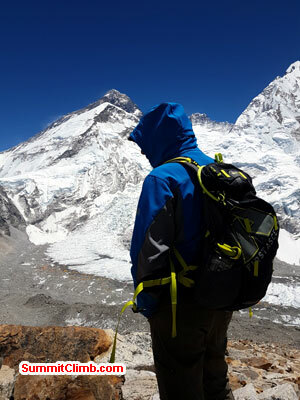 1 member trekked to basecamp and then climbed Lobuche Peak in our Everest Glacier School, with one Sherpa. 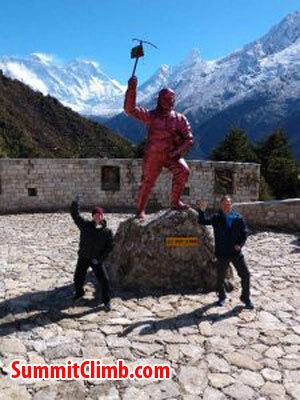 2 members (mother and son) trekked together with their husband/father to Namche. The father/husband went on to the summit of Everest! Everyone did a great job and everyone is now home safe. Congratulations! Also many thanks to the family, colleagues and friends who supported our members and encouraged them! Please Read Blog posts and see the beautiful photos and stories: Please click one of the links below to go directly to that blog post or just scroll down. 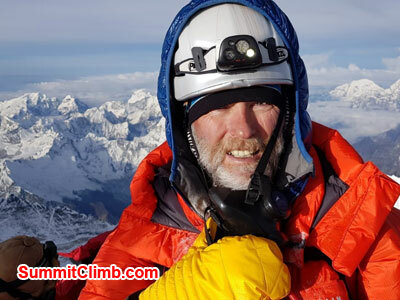 Neal K. at the Summit of Everest. Photo by. 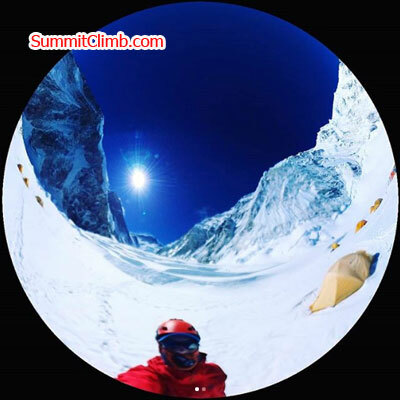 Neal K. Summit of Lhotse. Photo by. 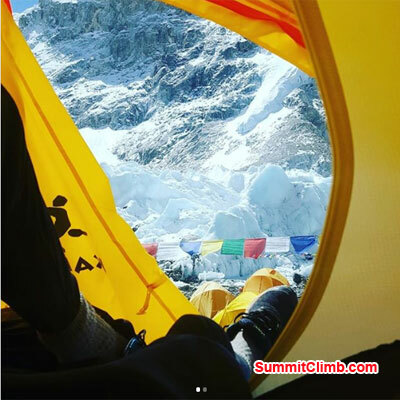 Matt W.
While we are resting up in basecamp waiting for a summit window I thought I would explain the hashtag #lhotse360. 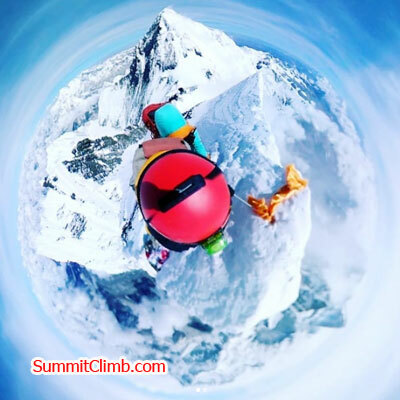 The first ever 360° photo taken from the summit of Lhotse (4th highest mountain in the world, 8516m).Photo by Matt W.
Statue at the top of the world. 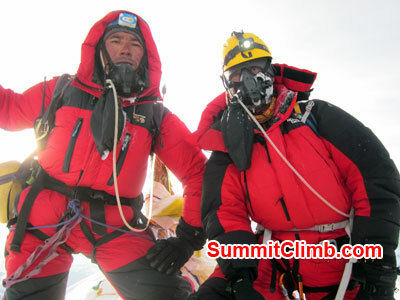 Tenji and Micheal at the summit of Everest. 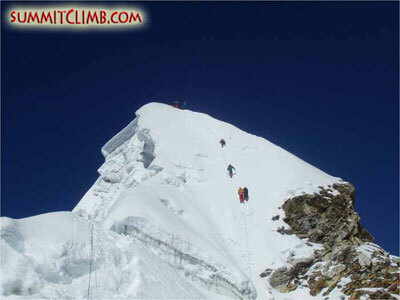 The famous hillary step from nepal side climb. Way you go for the summit rotation. 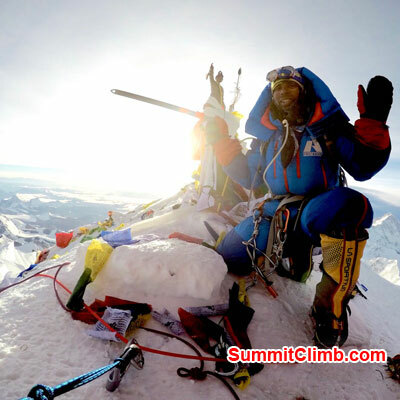 Ricci at the summit of Everest. The Famous Khumbu Ice Fall. Photo by Ricci. 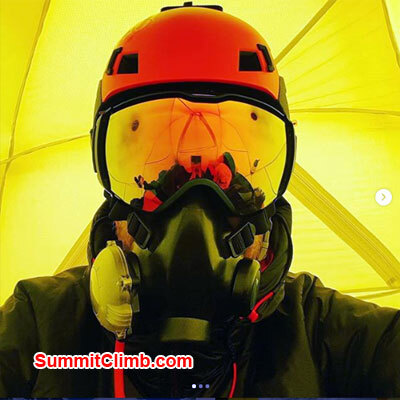 24 May - SummitClimb Everest Nepal Team SUMMITED yesterday. 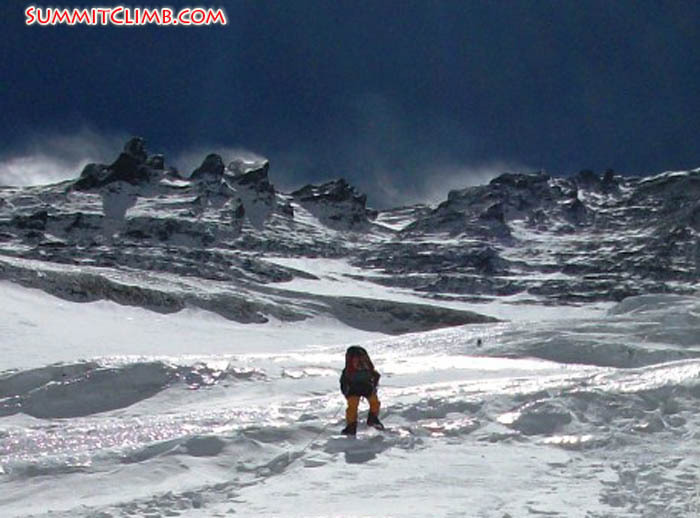 They rested last night at the South-col, now they are coming down to camp 2. Everyone is safe. 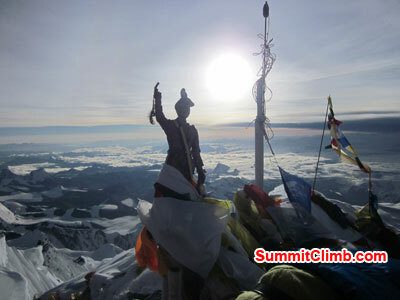 SummitClimb Lhotse Team SUMMITED yesterday. 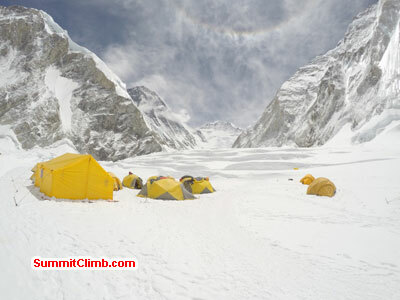 They rested last night at Camp 4, now they are coming down to camp 2 . Everyone is safe. Congratulations to everyone in the team and big thanks to all family, friends and colleagues for your support! 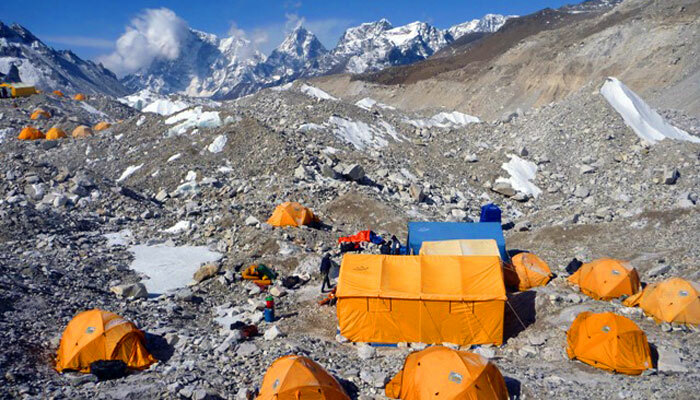 Everest Night and camp site. Photo by Ricci. 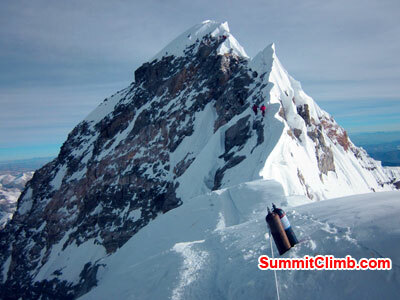 23 May - Everest Nepal SummitClimb team summited. 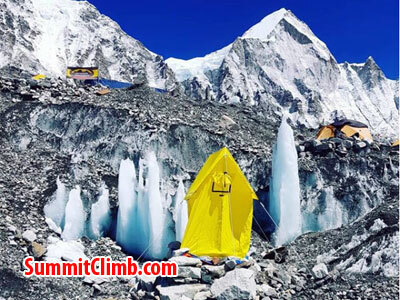 Some members are resting at southcol and some have moved further down to camp 3 and camp 2. 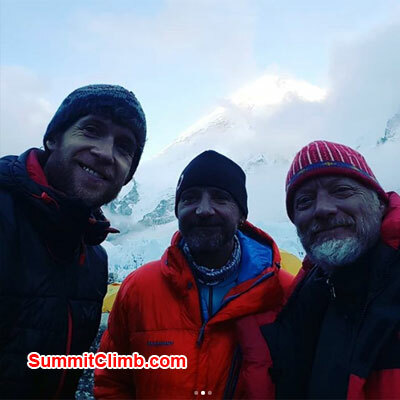 The Lhotse SummitClimb team also has summited. 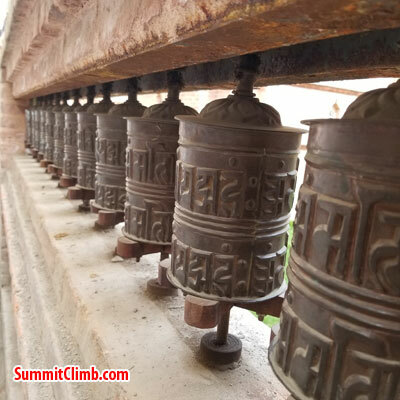 22 May - Update from Kaji Tamang - Everest Nepal Summit team ready for Summit Tonight . They are at SouthCol for the moment. 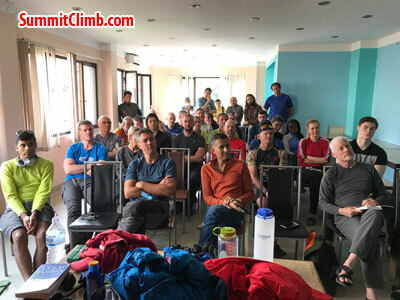 They will start their summit attempt from 7 P.M. Nepal Time on ward. Weather looks OK. 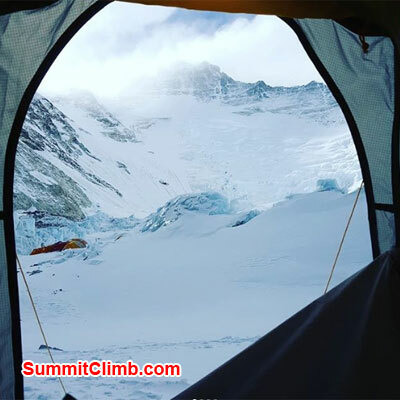 Whereas Lhotse Team already headed to Camp 4 today and from there they will start their summit attempt round about 2 A.M or 3 A.M early morning. Please wish them for Luck. 21 May - Update from Kaji Tamang. 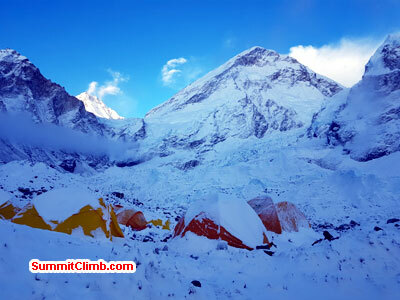 Everest Nepal Team are going to South col today whereas Lhotse Team are going to camp 3. 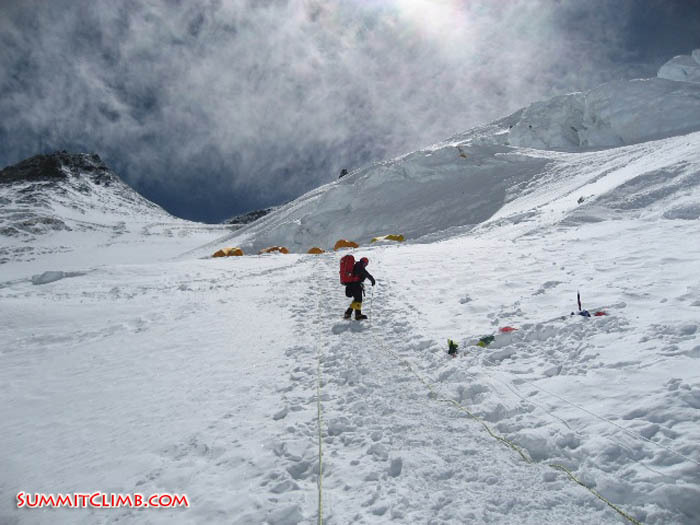 Climbing the final few steps into camp 3. That's the Geneva Spur on the left (Squash Falconer). 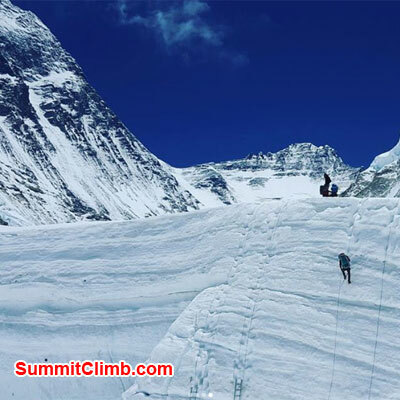 Climber works her way up the hard blue ice at the top of the Lhotse face (Alex Holt). 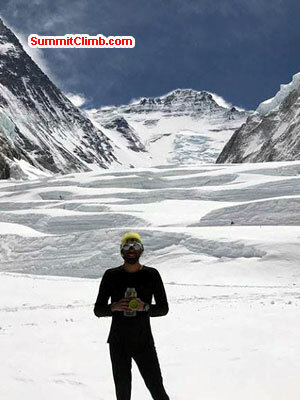 19 May - Update from Kaji Tamang - Everest Team are going up to camp 3 today, whereas Lhotse Team will take rest in Camp 2. Weather looks OK here at the moment. 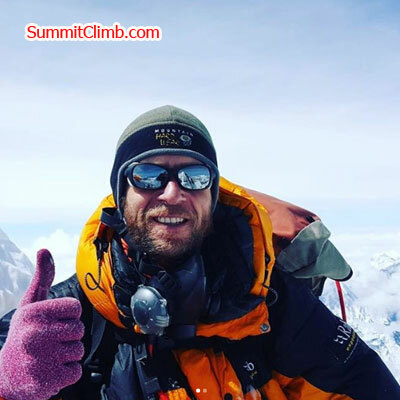 18 May - Update from Matt W. for Lhotse News - Final equipment checks have been done, acclimatisation rotations are complete and weather forecasts have been checked... tonight we (Tom, Heiko and I) head up on our summit run to the top Lhotse, the 4th highest mountain the world at 8516m. Scheduled summit date is 23rd May but of course this could be delayed once we are up there by any number of things. Wish me luck and I'll see you all next week with some new (tall) stories! 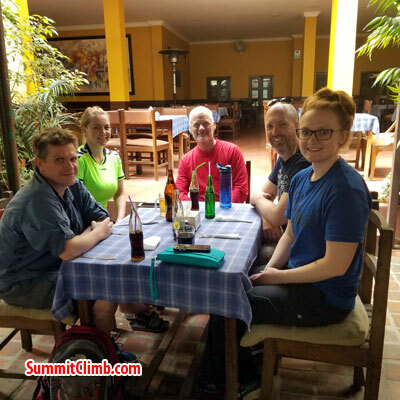 team being enjoying at basecamp before go for summit. Photo. Matt W.
17 May - Basecamp weather is good. 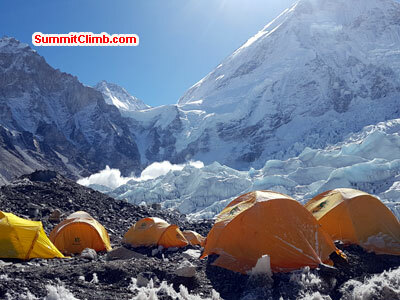 Tomorrow team are going for camp 2 from Basecamp. Planning to Summit on 22nd or 23rd. All is well. 16 May - It been real quiet as most members in namche but they will be flying in tomorrow. Matt & heiko resting @ EBC after doing a rotation to C3. Dani & Ciera are heading up to C2 3am tomorrow for another rotation to C3. 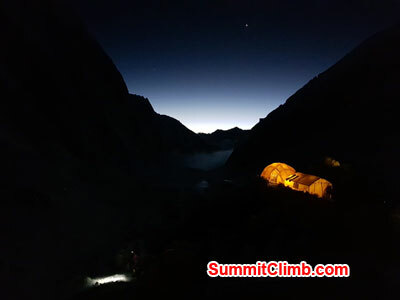 14 May - Lhotse News from Matt: - Just got back to basecamp after a successful 4 day rotation to camp 2 (6400m) in the middle of the Western Cwm and camp 3 (7100m) halfway up the Lhotse ice face. 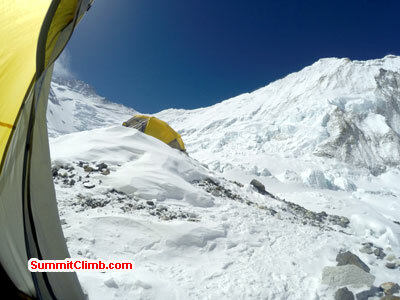 Very cold and windy few days, especially yesterday up to camp 3. Stunning to be back in the cwm though being overlooked by Everest, Lhotse and Nuptse - the summit of Lhotse was staring at me every time I opened my tent door, as you can see. Camp 1 with Mount Lhotse in background. Beautiful day in Basecamp. Photo Matt W.
6 May - All members are heading down to lower altitude today to recoup and recover, most are heading to namche bazaar 3440mtr which is a significant drop from EBC 5360mtr.Our hard working sherpa's and camp staff are still at camp sorting exped kit and load carrying up the mountain. Beautiful day in Basecamp. Camp 1 with Mount Lhotse in background. 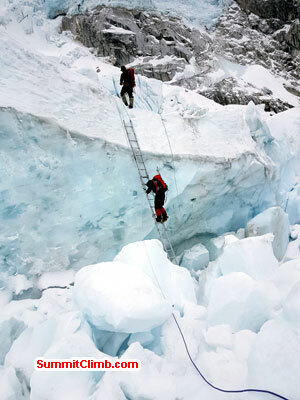 climber in khumbu Ice fall. Lots of snow fall last nigh. 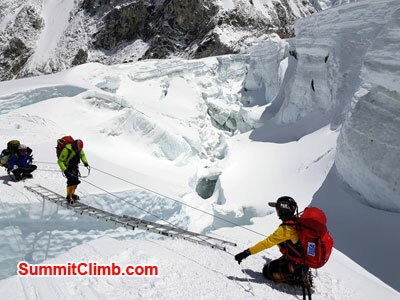 Climber working in ladder in Khumbu Icefall. 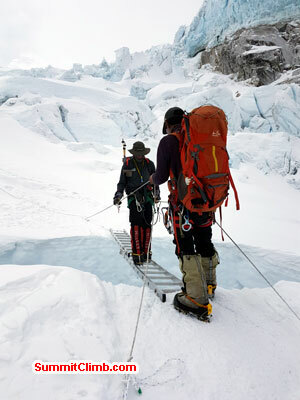 Team member crossing the famous khumbu Icefall. 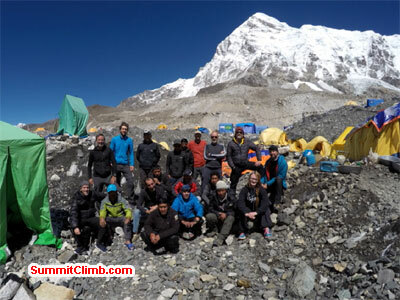 2 May - Update from Basecamp Manager Kaji Tamang - Everest Nepal Summit team and training team are doing fine. Some of them are in camp 3 and coming back to camp 2 for rest. Some are already in Basecamp. 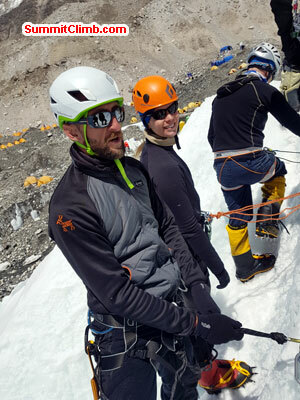 Matt and Kenneth are in the basecamp and doing ice training tomorrow in basecamp. 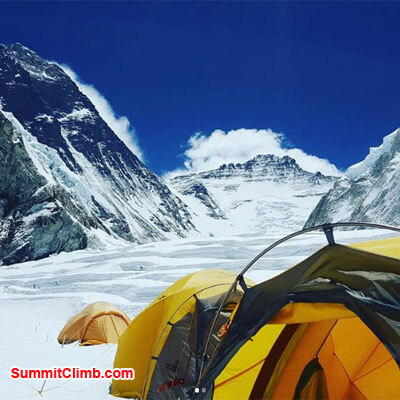 1 May - Update from Basecamp Manager Kaji Tamang - Everest Nepal team are still between camp 1 and camp 2 for acclimatisation rotation and training climbs doing well. 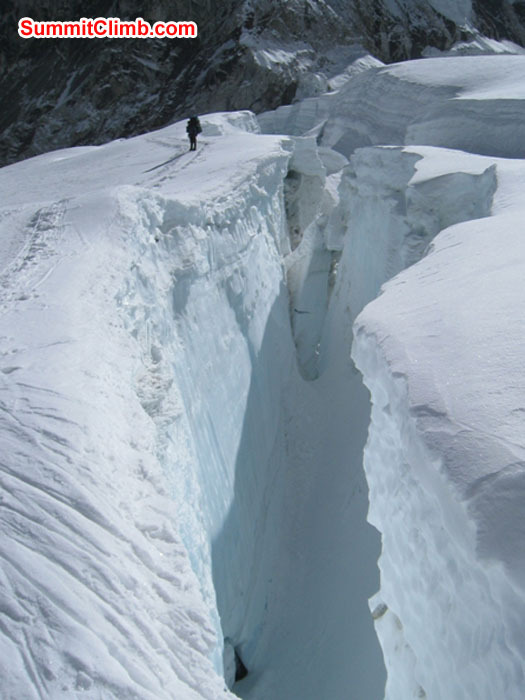 Walking beside a huge crevasse in the Western Cwm. Photo by Scott S. Clmbers headed over the top, making the transition from icefall to Western Cwm, where camp 1 is located. Team walking in the Western Cwm at the base of the Lhotse face.Photo by Monika W.
29 April - SummitClimb Everest Nepal Team are at Camp 1 resting. 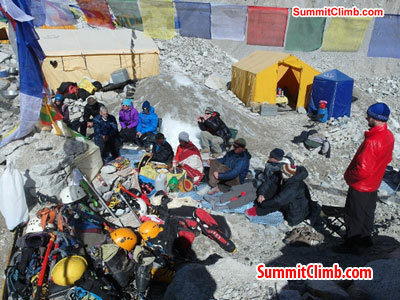 Some of our Sherpas went to set up Camp 2. 27 April - Matt is still in Pheriche adjusting to the altitude he is in good spirits and health wise ok but just taking a little longer to adjust. 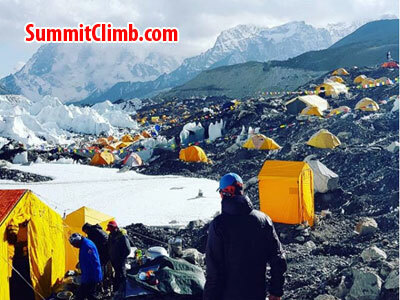 The rest of the members are packing and getting ready to head up the hill to camp 1 at 3am on the 28th with all our sherpa's. 26 April - Most members went for a hike today but it essentially has been a rest day. 25 April - Rest day today for members. still snowing today which is making progress for our sherpa's difficult at c2, the last of our sherpa's have just walked into camp 6.30pm So glad to see them safe and well. 24 April - Today we all went for an exploratory hike into the glacier, what a terrifyingly beautiful place that is to be respected and admired equally. Matt has headed down to Pheriche due to a persistent headache but he is feeling well otherwise. All is well. 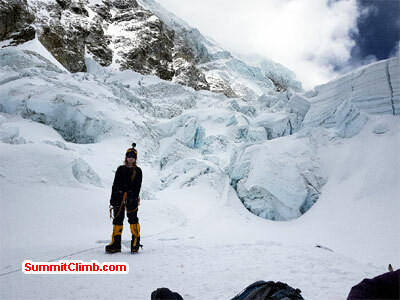 Ice training and personal equipment testing at Everest Basecamp before we go for rotation to camp 3. 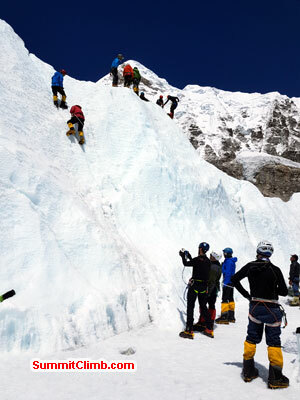 Ice training at Everest Bassecamp before we go for rotation to camp 3. Puja Ceromony before going for real action. Everest Summit seen from Pumori ABC. 23 April - Today all members participated in our Puja. Everybody is feeling well and starting to get accustomed to EBC altitude 5300mtr, some are even braving our awesome camp shower. 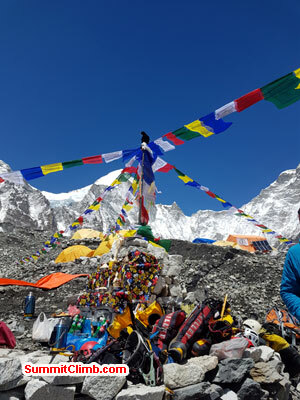 20 April - Christina has gone to lobuche Basecamp . Corinne / kristopher have gone to Thukla. All other climbing members are doing well and spent the day doing climbing training at EBC. 19 April - Chillen on Everest Basecamp. 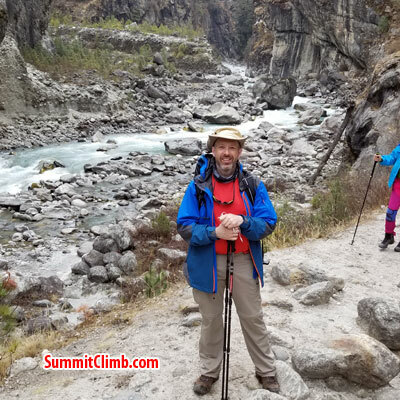 Sending 3 off to start their Lobuche summit attempt tomorrow. 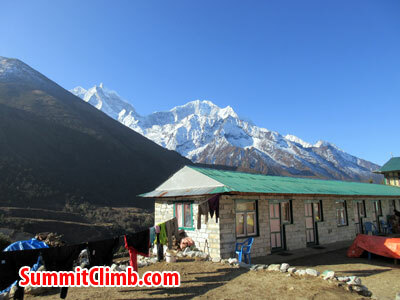 17 April - Last night we slept in Lobuche. It snowed. 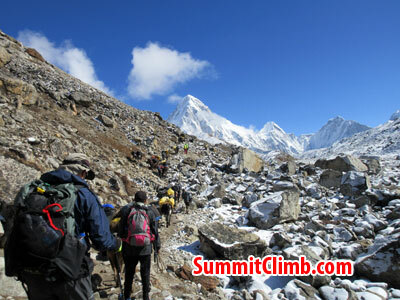 Now we are walking to Gorak Shep and base camp. Everyone ok. 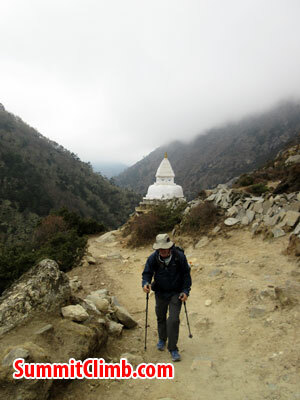 Walking in little cloudy day.after Namche statue of Tenjin Sherpa. 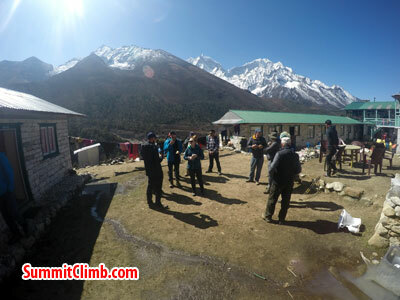 16 April - We are in Dingboche. 2nd night. Little snow but mainly good weather today. 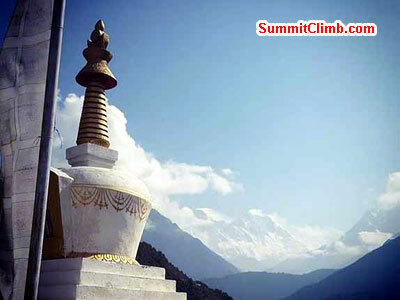 Tomorrow we are going to lobuche. Everyone is ok.
team member in Lobuche in beautifull day. trekkers enjoying the trek. jokyo taking rest at Namche. trekkers enjoying treks background Dudh koshi. 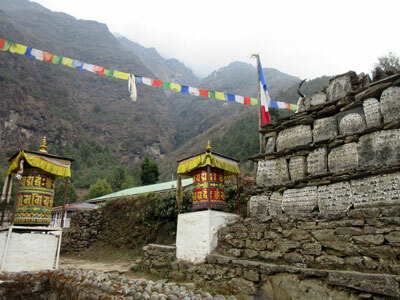 14 April - We are walking to Pangboche today. the morning has dawned with clouds down low and clear skies up high. 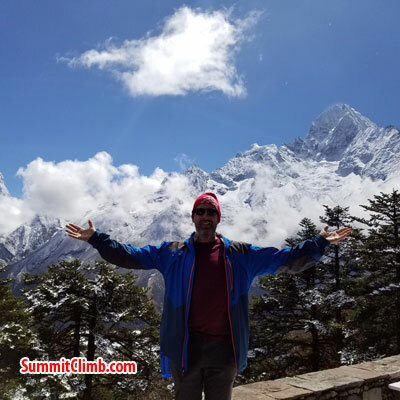 Everest Summit member is at Namche bazaar. 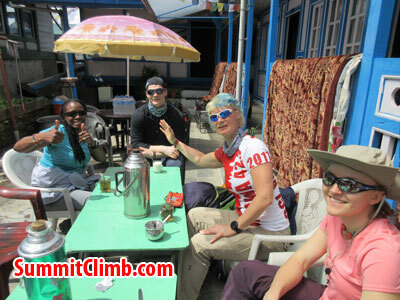 Everest Team members taking rest in tea house. 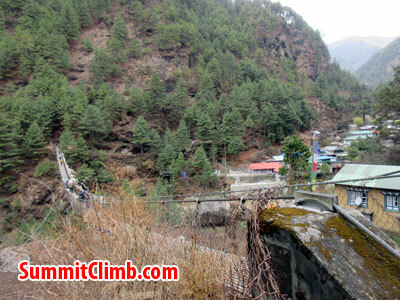 13 April - We rest in Namche Bazaar today. Capital of the Sherpa People. Some members walked to Everest View Hotel. Some members went to town to eat chocolate cake and drink cappuccino. Beautiful sunshine! Walking in little cloudy day. after Namche statue of Tenjin Sherpa. 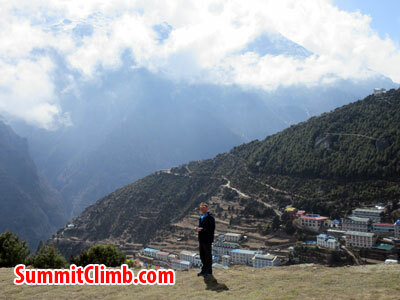 12 April - We walked up to Namche Bazaar today. Rain in afternoon. 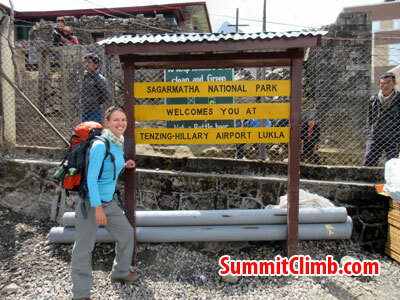 Team member at Sagarmatha National Park. 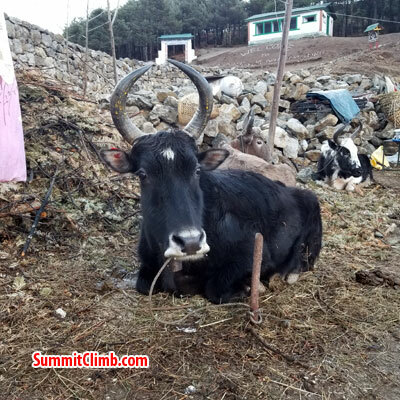 Yaks are being use for the loads for everest expedition. 11 April - We walked down to Phakding today. Beautiful forest. 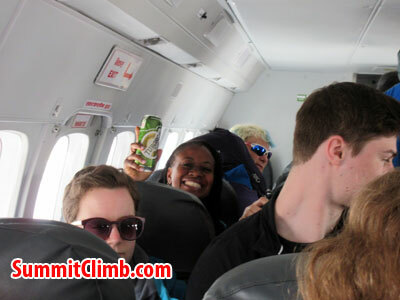 Team members are in lukla flight having their own beer. 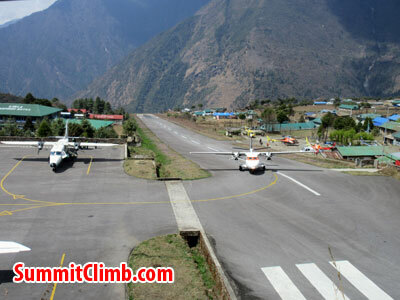 10 April - We flew to Lukla today. Cloudy weather. We decided to sleep in Lukla for a night. 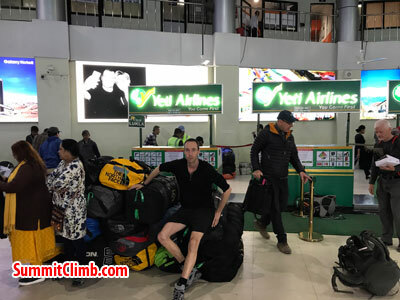 9 April: Today is our team briefing and last minute shopping, then packing for tomorrows early morning flight to Lukla. team mate at Kathmandu street. team mates at Kathmandu restaurant. 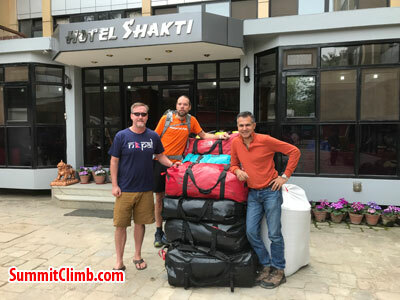 8 April: Our members are arriving in Kathmandu and we are checking their gear, then taking them out to the shops to buy and rent/hire what they need. Delicious dinner at a cultural dance restaurant.